Cyclesnack: There's $h!t on my leg! I was hammering down Sanford Road when all of a sudden I felt something cold and wet on my leg (and brown). I wiped it off with my glove and then smelled it! Blech! Dog pooh! I looked at my front tire and imbeded in the knobbies was more pooh. I did my best to wipe it off on some nearby grass. Still, I still kept getting whiffs along the way. You'd think my last week of time off before I start my new job I would be riding every day but with my daughter in a dance workshop and my wife swamped with freelance work, my role has become keeping my two sons busy. One thing for sure is that I am getting a lot of time with my kids but it's clear that I probably wouldn't make it as a stay at home Dad. Accolades go out to my wife and her ability to manage the kids! I was planning on doing a quick Echo Valley Loop and then try some of the Newtown Trailway (aka Al's Trail) but then I figured that I should hit it first because I wasn't sure how far I would get, not to mention the pooh incident sort of had me off my game at this point. So rather than pedaling up the Brody Road, I headed down towards the water on what was probably the discontinued portion of Echo Valley Road. Clearly people are riding this section because there were some nice up-and-overs built on some of the downed trees blocking the trail. The trail pops out onto Albert's Hill Road so it's knobbies on asphalt for bit but I detoured into some Newtown Forestry Assoication property to check it out but there was nothing special, not even a loop. Once back on the trail, it basically follows some very old horse cart roads, essentially dual track, although there are a few sections where the trail was nicely benched into the side of a steep slope. If you went off the trail, you'd most likely slide for quite a bit. There were some nice rock gardens along the way, and the stream crossing were expertly armored. Above is the placard for the Shepaug Dam. It's right on the trail looking upwards at the dam but with the tree cover it was tough to see the dam. Before turning onto this section, there was a side trail that headed closer to the dam. Probably an old access way for when they were building the dam. Below is the best shot of the dam. The shot below is looking across the river. In the background you can see the bald eagle viewing shack. This is looking back down the side trail that was probably used in the past during the construction of the dam. It appears to have continued up to the dam, however, part of the hill caved in so the original road grade was obliterated. It looked like there was a trail along the edge but you'd have to be crazy to walk that. This shot is look back up the side trail. There is a turn off for another road grade that heads down towards the water. There is a lot of poison ivy here, so I didn't stay long. I got to where the trail comes out on Walnut Tree Hill and decided to turn around. In fact I was running out of time and decided when I hit the gas line/old Rail Road bed, I would take that route back. Not only would it be faster but very nostalgic. This bed was the same road for the Larkin State Bridal Trail, which was the line that went between Hawleyville and Waterbury. After coming down back from Walnut Tree Hill I was coming down a short hill and riding through some ferns when I hit something that popped my chain off the back sproket. Stopped and got the chain back on but noticed that the bike wouldn't shift to lowest gear! Looks like the 'Horse needs some work. There was this pristine beaver pond along the right of way. I'd love to get my canoe in there and do a little fishing. The gas line cuts through the middle of the McLaughlin winery. It looks like I am in Nappa Valley. Here is what today's ride looks like with the rest of Upper Paugussett. 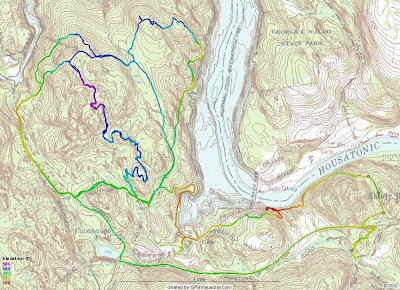 If I were to do the same route with the Echo Valley Loop, I'd be easily over 10 miles! Below is the composite map.